A good example of managing multiple social media accounts is with Pinterest and Pinterest Business. One speaks to any user on Pinterest while the other gives business-specific advice. In this article, you’ll get an idea on why managing multiple social media accounts might be necessary and how you’d go about keeping all your messages, content and analytics in one place. If you’re a single brand and not a marketing agency in charge of managing multiple clients, there are a few reasons for and against starting new accounts. Segmented audiences: Using different accounts allows you to talk to various audiences. No more balancing your posts to make sure you’re reaching everyone. This is helpful especially for businesses that serve both businesses and consumers. Location-specific news: For multi-location businesses, having individual pages may help you serve the unique needs of each geo you’re targeting. Topic-specific focuses: Some brands have different topics that they take on. For example, BuzzFeed has one umbrella account and then also has other accounts like BuzzFeed Weddings, BuzzFeed Video and BuzzFeed Animals. While all of the specializations can feed into the parent account’s posts, the audience has some choice in which topic they want to follow. More work: Having more accounts means more work for social media managers. If you don’t have the time or money to spend on more work, consider a different approach. Difficult to manage branding: If you’re using multiple accounts for various departments, then it might become more difficult to keep branding consistent. This is where a documented brand and social strategy comes in handy. According to the Q3 2017 Sprout Social Index, social media ranks second only to in-person for consumer complaints. 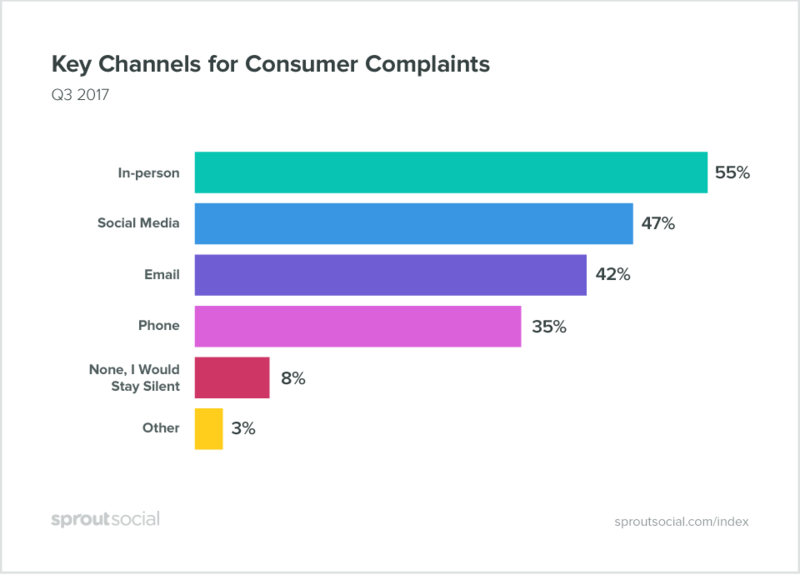 In fact, 47% of consumers have taken to social media to complain. If you find that addressing complaints and issues is taking up the majority of your account’s post, you may benefit from starting a separate support account. Fitbit Support is a good example of this in action. Their staff is able to quickly address concerns and problem solve. Their Direct Messages are all about support tickets and won’t be lost in the noise of the Fitbit account. With the caveat that we generally do not promote automatic posts, there are some cases where they come in handy. These are most often used for topics like technical updates, weather alerts or content curation. 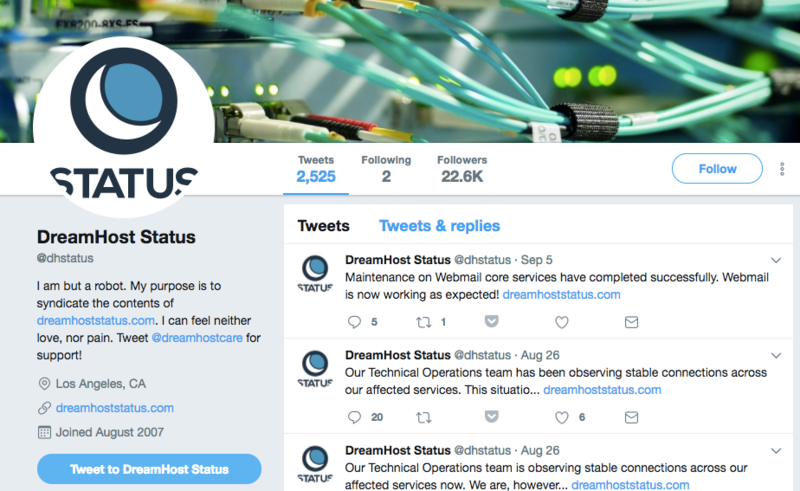 DreamHost Status is an automatic account that Tweets out server and service statuses. The bio clearly indicates that it’s a robot and even provides the account that does handle support. If you’re a university, chances are that each department and sports program has their own account. The voice may vary between accounts and the audience will surely be different. In fact, you can see how Marquette University was able to see a 45% increase in click-through rates on Facebook with Sprout! Other universities tend to rely on multiple accounts as well. For example, Michigan State University’s colleges, sports teams, clubs and graduate programs all have their own accounts. People can follow the accounts they’re interested in and not have to worry about the rest. There may be fewer followers but in exchange, they hope for more valuable engagement. When you have multiple business locations that run their own sales or if you own a franchise location, you usually want to set up different accounts. These will help your customers find information faster and receive better targeted ads. 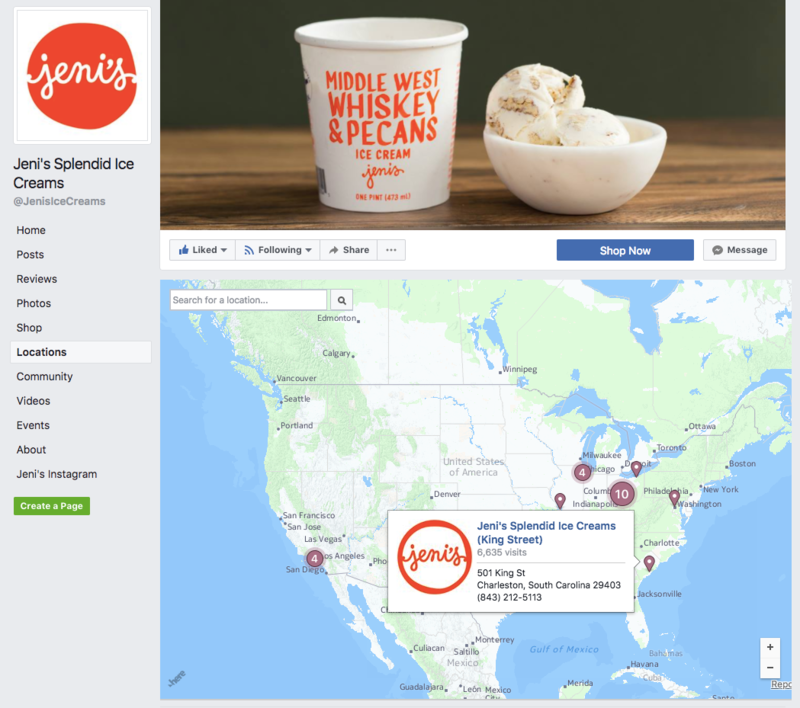 Jeni’s Splendid Ice Creams has locations all around the US. They’re easily accessed in a Locations tab on its Facebook Page and each location sends out relevant information. If you compare the brand page next to the location pages, you may find that some of the same posts appear. That’s okay as long as it’s relevant for everyone. If you’re a corporation, chances are that you’ve created enough products, each with their own audiences. Microsoft is an example of this with an entire suite of products, services and events. The accounts serve vastly different audiences and allows them to reach a wide net of people. 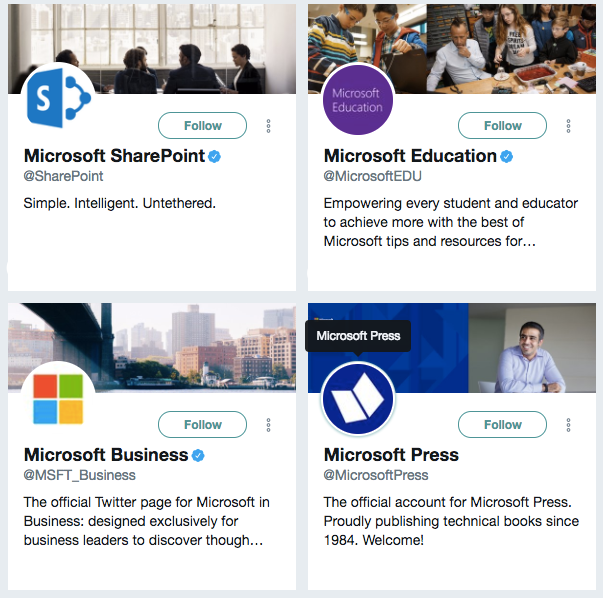 For enterprise social media businesses like Microsoft and UPS, they rely on Sprout Social to keep all accounts, users and profiles in one easy to manage space. See our enterprise tools in action with a free 30-day trial! It’s easy to let multiple accounts run loose on their own. If you make the decision to have multiple accounts, you need to have a documented strategy and even a style guide. You can create one general strategy and one individual account strategy but the idea is the same. Documented strategies help teams keep in sync with each other. The last thing you want to do is copy and paste the same post into multiple Facebook Pages. Find a social media management software that will help you manage both engagement and publishing in one program. For publishing, Sprout Social handles multiple accounts with ease. With groups, you can easily publish the same content for multiple accounts and multiple networks with one button. 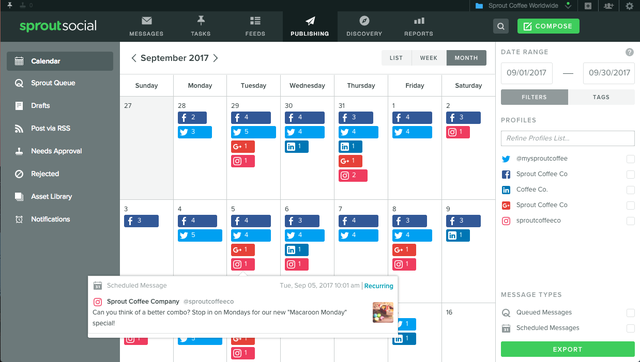 To make sure you’re on track for your social strategy, utilize an editorial calendar in a document or in your chosen management software. 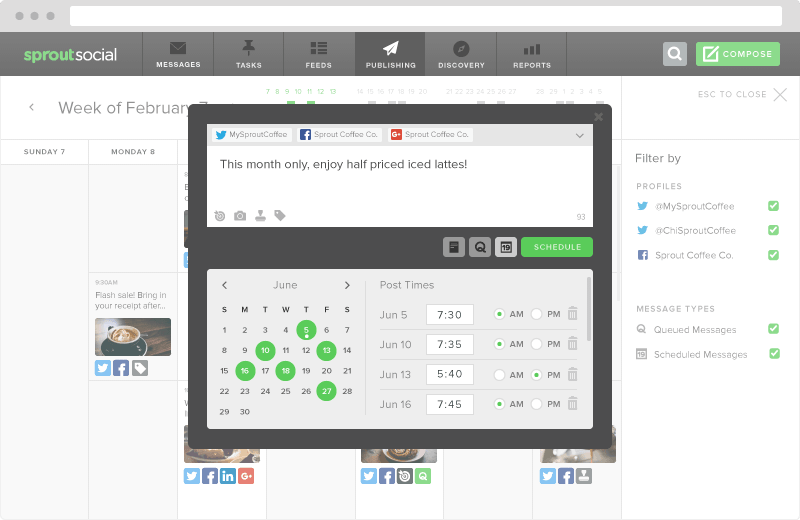 The Sprout Social Publishing Calendar gives a visual look at all of your upcoming posts across your networks. 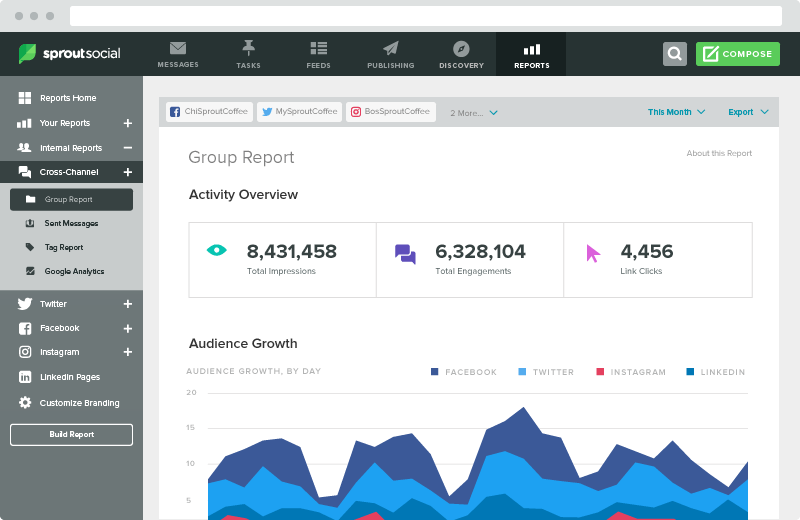 This helps you look at your marketing campaigns and social posts all in one place. It’s also especially helpful for spotting gaps in your posting schedule. If you set up a support-specific account, monitoring keywords and mentions is very important. In addition, you want to make sure you’re not overlapping work with your coworker. 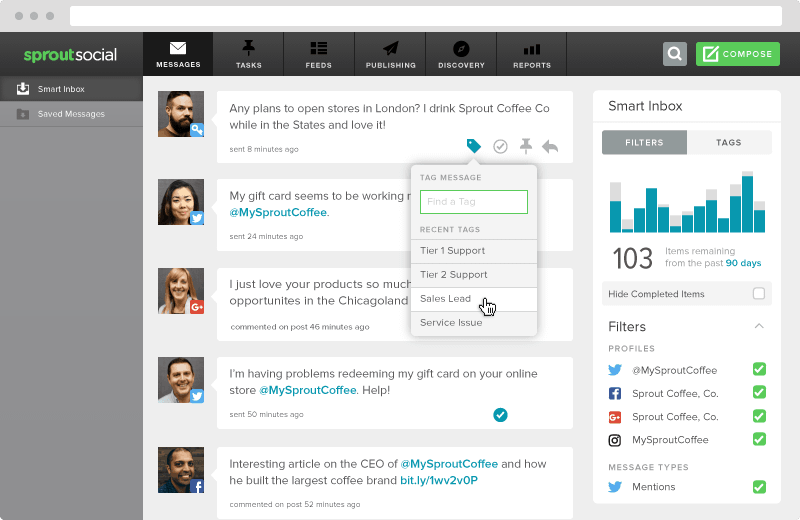 Your social media management software should include the ability to collaborate with your team. It doesn’t look good to the customer if the brand replies twice to the same Instagram post. 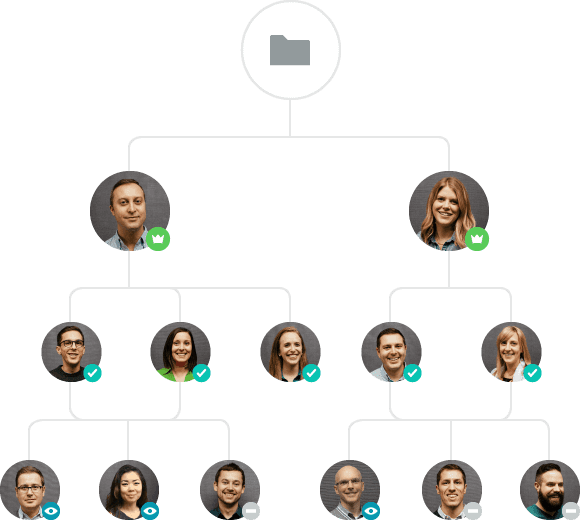 Take a look at our team collaboration features here. How are all of your accounts doing on an individual level? And how does the collective effort look for your brand? Maybe multiple accounts aren’t for you but you won’t know until you look at the analytics. Track analytics across your individual accounts and how they perform together. If you’re an agency, freelancer or corporation, you may find yourself wanting to restrict access for some of your profiles. Perhaps the corporate office wants to see all that’s scheduled for every location but they don’t want to risk having locations post from the wrong profile. Luckily, Sprout Social has already taken tiered access into account and is scaleable for every level of business. Hyatt, with its multiple brands and locations, uses Sprout Social to easily divide up their posts and serve them up to their relevant audiences. There are many reasons to consider adding new social accounts to your mix. In the end, you want to make sure you’re adding them for the right reason and not just because you’ve seen your competitor do it. Once you’ve made the decision, plan it out and find the right tool to help you execute.